Harper Commerial Dual Truck - 300 LBS. 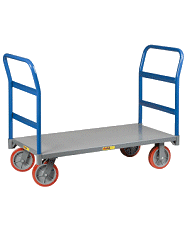 DUAL TRUCK CONVERTS FROM HAND TRUCK TO PLATFORM TRUCK IN SECONDS. CENTER STRAP PROHIBITS SMALL OBJECTS FROM FALLING THROUGH.